Hop on the complimentary shuttle from any of its 20 convenient downtown New Orleans locations. When you arrive at Mardi Gras World, located on the beautiful riverfront, you’ll be greeted by your friendly, knowledgeable guide for a 1-hour behind-the-scenes tour of this famous facility. 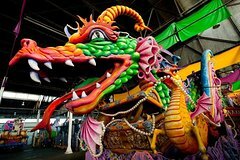 Explore the warehouses where artisans create spectacular Mardi Gras floats that are used in more than 40 parades each year. Admire the intricate designs and vibrant colors of these interesting, one-of-a-kind creations as your guide explains their meanings. Wandering through these magical studio spaces, you’ll see firsthand the skillful craftsmanship that goes into every float, giving you unique insight into the hard work, creativity and extensive planning that goes into such a grand celebration. Your guide will teach you about the history of this unique and festive tradition that goes beyond its modern-day reputation of wild celebration antics. Snap photos in front of the floats, pose with props, and try on Mardi Gras costumes with your friends and family. Top your experience off with a piece of King Cake, a delicious Mardi Gras tradition!